One natural gas gusher plus a record mineral lease sale could mean a big new play for energy producers and horizontal hydraulic fracturing in Michigan. One of the last wells drilled into Michigan’s Antrim Shale was completed early last week in Benzie County. A new and deeper natural gas play appears to be unfolding as developers pay record amounts for oil and gas leases and a lone Missaukee well turned out to be a prodigious gas producer. Click image to launch slideshow. Earlier this year the Pioneer well’s Canadian owner, the Calgary-based Encana Corporation, announced that during its first 30 days the well, drilled nearly two miles deep into a rock formation known as the Collingwood Shale, produced an average of 2.5 million cubic feet of gas a day. 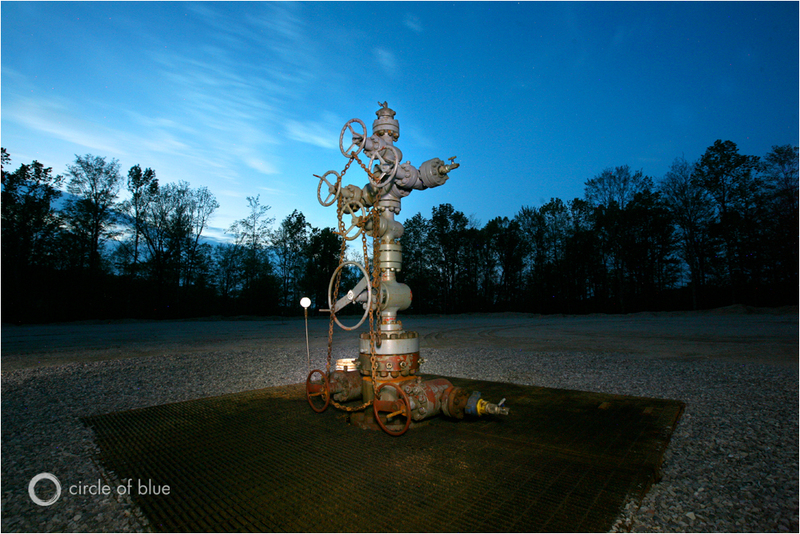 That made it, for a time, the most prolific single source of natural gas in Michigan. Production has since dropped back to 800,000 cubic feet per day, said state officials, though that is still a prodigious amount for a Michigan gas well. Arnie Workman and Mike Rudolph were among the 400 people who jammed Reed City’s Church of the Nazarene for a meeting on oil and gas leasing on Friday, July 23, 2010. At the top of the list of concerns: how to lease their minerals effective and learning more about the potential environmental risks of developing Michigan’s Collingwood Shale. In Michigan, water used to drill oil and gas wells, and then pumped back out during production is disposed of in deep injection wells, said Hal Fitch, the director of the state Geological Survey Office. The risks to freshwater relate to the volume of water being pumped from the site. The Geological Survey Office evaluates permits to determine potential effects on aquifers and local surface water systems (such as a wetland, lake or stream). In the case of the Pioneer well, 5.5 million gallons of water pumped from a well exceeded the Michigan Great Lakes Preservation Act. However, there are waivers and exemptions for gas and oil drilling. Fitch said that these provisions will be reviewed, on a case by case basis, if it looks like the scale of hydraulic fracturing is extensive enough to cause concern. The Pioneer well in Missaukee County reaches down 9,685 feet to tap what may be a motherlode of natural gas. Developing the well took 5.5 million gallons of water and thousands of pounds of chemicals pumped at high pressure to fracture the Collingwood Shale and release a torrent of gas. Fitch added that state regulators make sure the activity is not depleting the aquifer at that site. But they do not look at cumulative effects of water withdrawals, the watershed-scale effects of withdrawals. 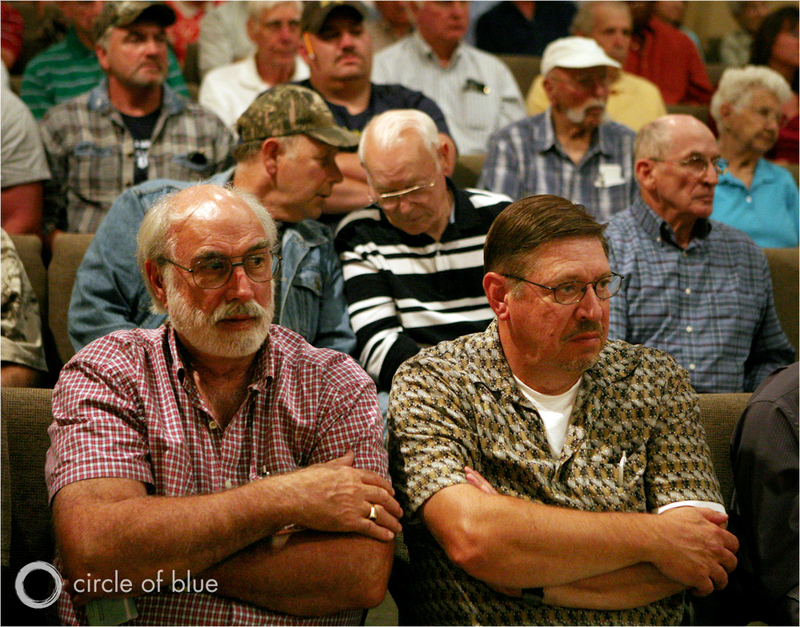 Photos by Heather Rousseau, a reporter and photojournalist for Circle of Blue. Reach her at circleofblue.org/contact. 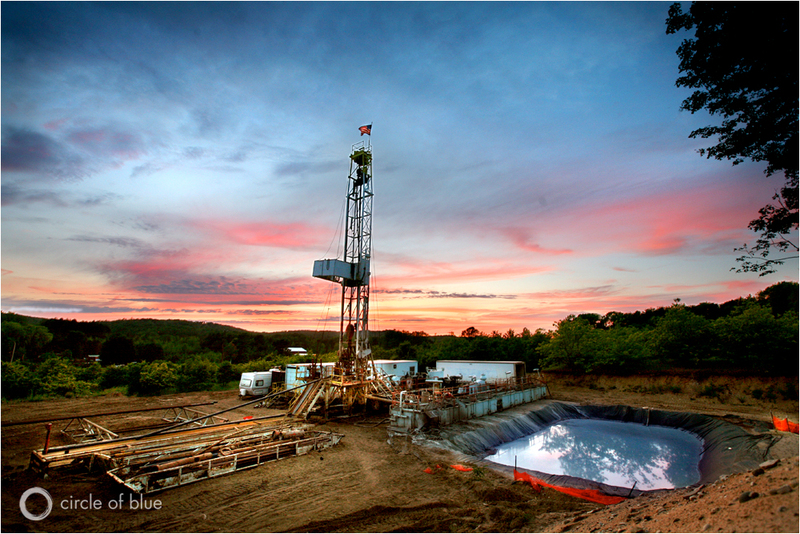 Fracturing is a danger to Michigan’s watershed. Those interested in joining Don’t Frack Michigan and our campaign to ban horizontal hydrofracking in MIchigan, please contact me at luannekozma@gmail.com. Take a look at what Encana is doing in northern British Columbia at the oil sands deposit and you won’t let them work within 100 miles of your property. I don’t remember the title but it’s detailed in a “Nature of Things” episode on the BBC. It would also be a good idea to watch the HBO documentary “Gasland” which shows the direct effects of fracturing. Spread the word, our water is more important than money. Given the economic state that Michigan is in, this sounds too good to be true. Imagine how many businesses would have to hire more staff? How many jobs would be created directly in the industry? I may be wrong, but I believe the oil and gas industry pays pretty well! Yes. Watch ‘Gasland’. See how propaganda is spread. If my neighbors became wealthy and I did not, I would be happy for them, not jealous! As far as the water table, check into what Keystone state of Pennsylvania has found in the areas of the Marcellus formation. Not a whole lot of contamination! Very little. So little that PA is a major hot spot. DEQ is tight, which they should be. Precautions are taken, spills and other forms of environmental mishaps are to a minimum. Drill the heck out of Michigan! Let’s get some of the economy back! booms are not economies. economies are economies. practical and proper tax equality, governance, distribution, property protections and environmental quality are what make a place desirable to live in. not methane. natural gas is a resource but a dangerous one with a not unjustified soiled reputation. It’s extraction is going to happen, but it should be done under incredibly tight regulation to protect the delicate balance of what really makes Michigan a nice place to live. The sanctity of property rights must be preserved. Methane seepage and water contamination are ridiculously bad externalities and must be prevented where possible and excessively compensated where not. Compensation for these needs to be in the hundreds of millions of dollars to be effective deterrents. @Chris: “Drill the heck out of Michigan” – ? If it stimulates the economy so well, I believe you could get some good real estate deals in PA, CO and Idaho now.